.. and VisualGPS to check signals etc.. It took about 15 minutes for the first cold start but after that it worked fine.. 5 to 10 satellites while driving at city center.. Testing more tomorrow.. Navigon Navigator going in..
Great as usual. i will be ordering mine in pair of weeks... just waiting for mobilx.hu to have it available. Do you mean, it needs about 15 minutes everytime you boot it up or did it only take as long at the very first time? By the way, the comment-function works perfectly now, thank you! Im just waiting for mobilx to have available and i will order one. its easy than ordering from dfj-store because from mobilx i dont have to worry with customs tax and all that stuff. Mobilx claims that their version has a sim slot alredy installed?! do you thing its possible that the mini pci slot is already there too? not the 3g card it self but the slot. 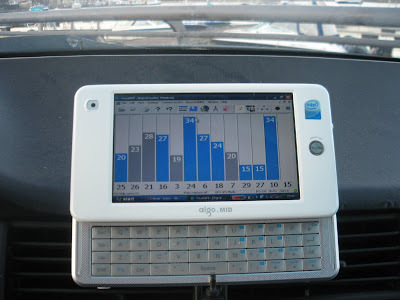 It seems the GPS software is running on Windows XP but I am wondering if there is a software for linux that comes with Aigo MID. I would rather stick with the original OS of the device. 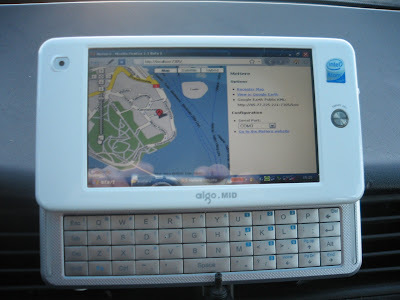 Hi, which software did you use to view the maps Aigo MID? I've installed u-blox but it didn't work.